Byron’s Smokehouse, Auburn AL – Marie, Let's Eat! 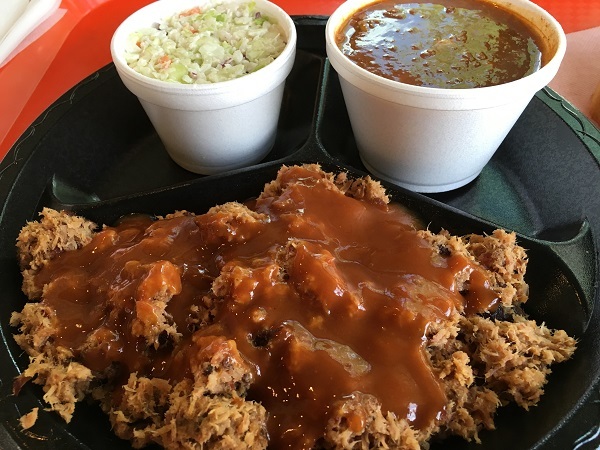 When we visited Auburn in 2014, one question that jumped out as we planned the trip was which of the two well-known barbecue places we would visit. We went with Price’s, in part because of its terrific campus-friendly location, which, in the end, doomed the restaurant as developers bulldoze everything within walking distance of the classroom buildings in favor of mixed-use places. Price’s closed for the final time about a week after our visit, which is a real shame. 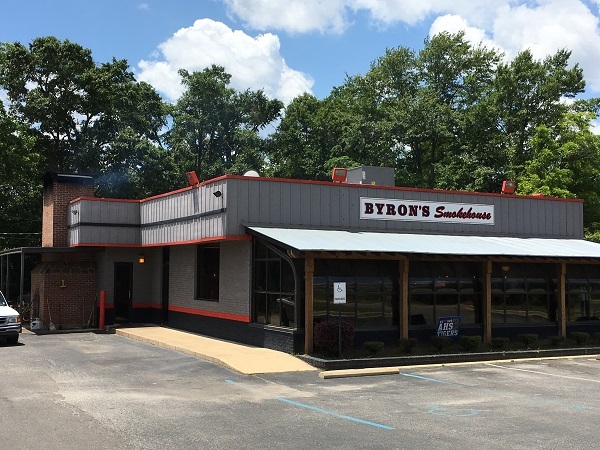 Byron’s Smokehouse, on the other hand, is a couple of miles away from campus, and safe – for now – from being turned into a high rise with condos and a Subway. Glen and Stephanie Gulledge are the current owners of this restaurant, which is a favorite of ESPN’s Todd Blackledge. Should you want to meet Todd, find out when he’s covering an Auburn home game and arrange to eat here then. Glen’s father Byron opened the Smokehouse in 1989, apparently too restless to retire, and passed it down to Glen in the 2000s. For about the last thirteen years, it’s been in its present home, a former Dairy Queen with a brick fireplace built into the rear. I’ll say this: for all that I champion Georgia barbecue, Alabama has it all over us with their use of brick pits. In Georgia, you see Southern Prides everywhere, and while in Alabama these are not unknown, it really seems that a majority of barbecue places have a proper wood-burning pit. Truth hurts a little sometimes. 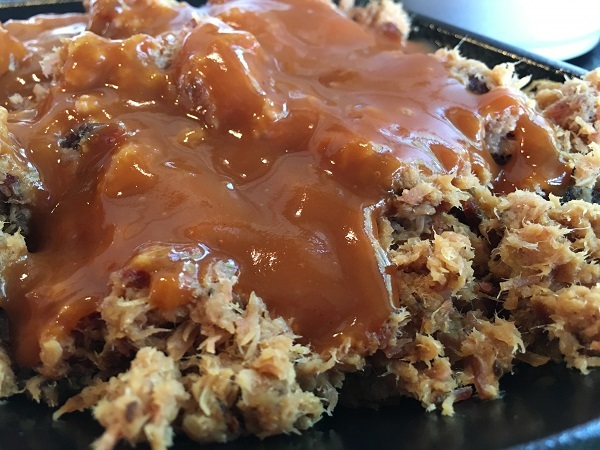 As expected, the chipped pork here is cooked in a mustard-based sauce, as you’ll find throughout the region and into Columbus, where the style originated. It’s usually a dark brown mustard with just a hint of sweetness. If you ask for hot sauce, they serve it with an extra ladle of the hotter sauce atop the meat, which has already been simmering in the fireplace. It’s been too long between visits for me to nail down specifics between the places that offer this style – a hazard with our haphazard hobby – but this is indeed very similar to Chuck’s, Price’s, and the Smoky Pig. The stew and slaw are both homemade and terrific. We were expecting plenty of Auburn memorabilia on this trip, but even I was surprised by how much stuff was on the walls here. 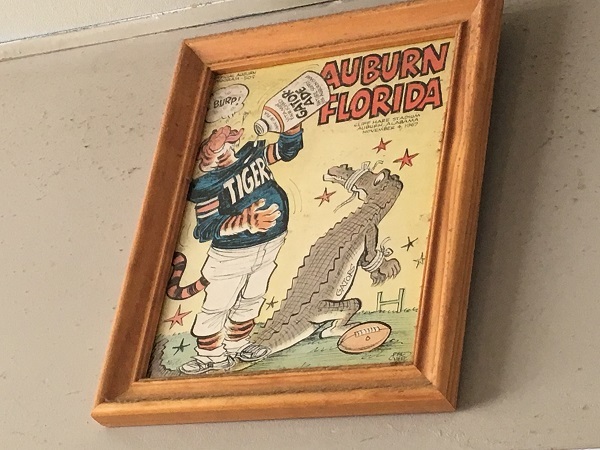 One of the neatest treasures is a long line of framed programs from the 1960s and early ’70s featuring their mascot beating up every other school’s mascot. These are clearly – actually, “flagrantly” might be a better word – inspired by all the artwork that Jack Davis provided for UGA during that period featuring Hairy Dawg doing much the same, but since so little of any other school’s derivative work is out there for people to see, this is a downright fantastic little museum of fun artwork. I ate alone here while my family kicked back and waited for me to get finished. I didn’t make them wait too long for me, but the few words that I exchanged with Glen suggested that I could have spent hours, because he’s a guy who loves talking about his food and is happy to welcome anybody into his good little restaurant, even Georgia fans like us. While UGA isn’t among the teams traveling to Auburn this season, I see that Jordan-Hare Stadium has an eyebrow-raising five home games in a row starting in three weeks. If you’re coming to “the Plains” to support Clemson, Arkansas State, Texas A&M, LSU, or Louisiana-Monroe, pick up your tailgating here. Are you planning a barbecue road trip? You can see all the barbecue restaurants that we have visited for our blog (more than 380 !) on this map, with links back to the original blog posts! Posted on August 8, 2016 by Grant G.Posted in alabama, auburn / opelika, barbecueTagged alabama, auburn, barbecue, not fooling anybody. More great Alabama barbecue. I have heard of Price’s and am sorry that it closed. Price’s was a classic and should never have closed. I’d like to feed that developer to piranha. But seriously, it has broken my heart that Price’s is closed. I don’t get back to Auburn every season, but Price’s had been a destination that we revisited many many times for the last 23 years. I second your call to feed the developer to the fish and salute your barbecue love, sir! I’m sure that you will enjoy Byron’s a lot, even if they have a lot to live up to in your love for Price’s. We’ll see y’all Between the Hedges on November 12. Go Dawgs!